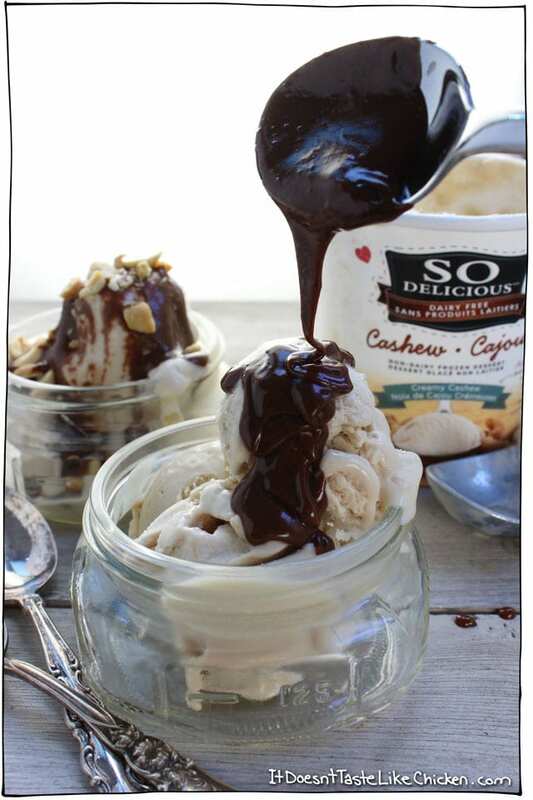 This recipe for Vegan Peanut Butter Hot Fudge Sundae is sponsored by So Delicious, who I love for their cashewmilk frozen dessert. Seriously, it’s creamy, sweet, and slightly salty giving it this kind of salted caramel beautiful thang going on. In love! It has been a long time since I have had a sundae. I seriously forgot just how good they were! 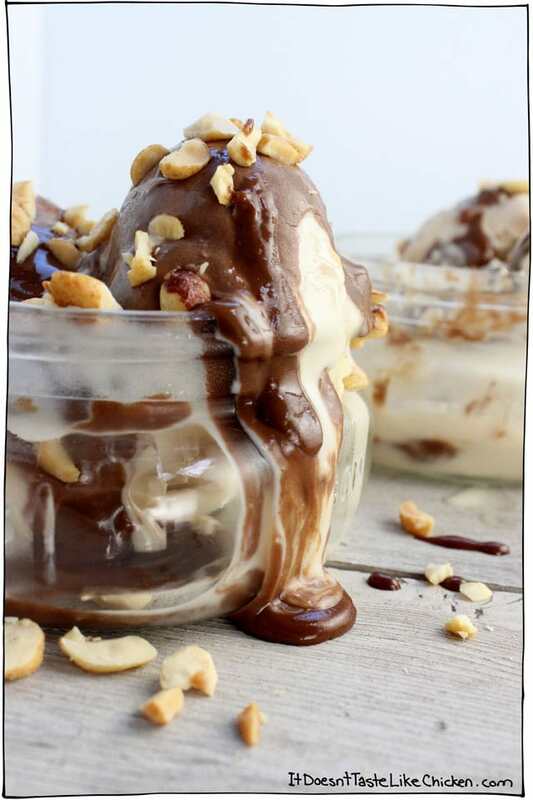 I made the Vegan Peanut Butter Hot Fudge Sundae sauce, and that was wow delicious, but it wasn’t until I actually finished this photo shoot that I tasted the fully assembled sundae that I truly rediscovered the gloriousness. By then there was hot fudge sauce and meltiness everywhere, it even managed to have gotten on my camera, eek! I scooped up a bite and ohmygoodnessgraciousme. There’s a reason this is a classic dessert, and that reason is pretty clear. YUM! Like seriously, whoa. Not only is this mind-blowingly good, but the sauce literally takes 5 minutes to make. 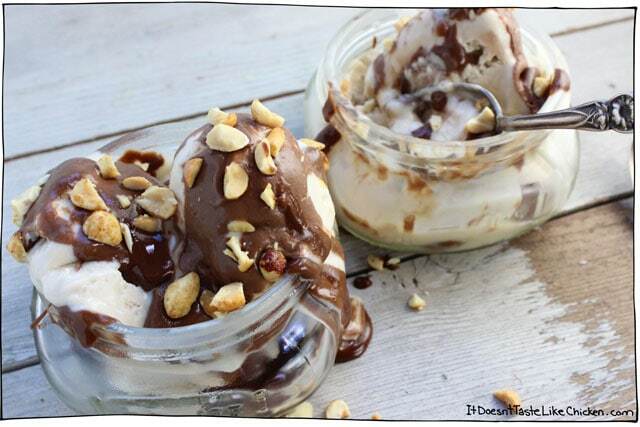 The peanut butter gives the sundae this peanut butter cup kinda feel, and the So Delicious Cashewmilk Frozen Dessert is the perfect compliment with it’s slightly salted taste. Gah! 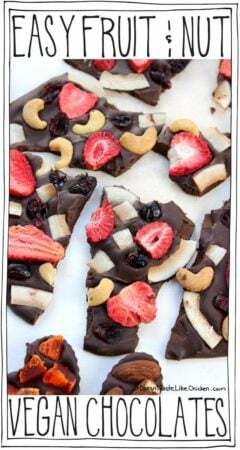 This recipe is a little too easy, and a little too delicious if you ask me! 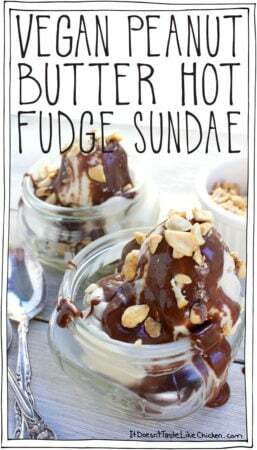 To make the Peanut Butter Hot Fudge Sauce: add all of the sauce ingredients to a small sauce pan and put over medium heat. 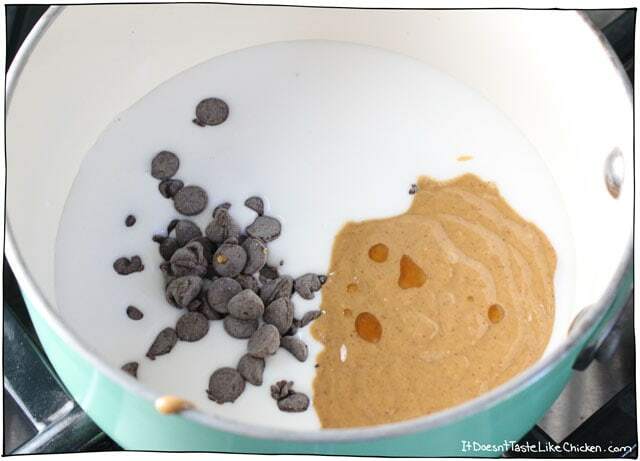 Stir continually as the chocolate chips begin to melt. Just before the chocolate has completely melted, remove from the heat and continue to stir until the chocolate has finished melting. This ensures that you do not burn the chocolate. 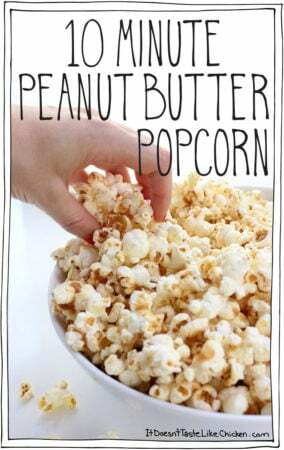 Sprinkle with chopped peanuts, then devour. And devour you will! (Trust me on that one). Like seriously, whoa. Not only is this mind-blowingly good, but the sauce takes just 5 minutes to make. 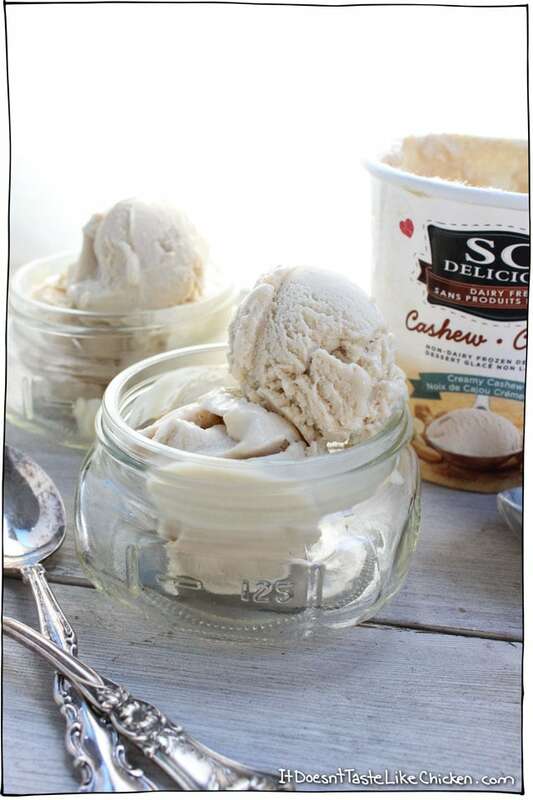 The peanut butter gives the sundae this peanut butter cup kinda feel, and the So Delicious Cashewmilk Frozen Dessert is the perfect compliment with it's slightly salted taste. Gah! This recipe is a little too easy, and a little too delicious if you ask me. 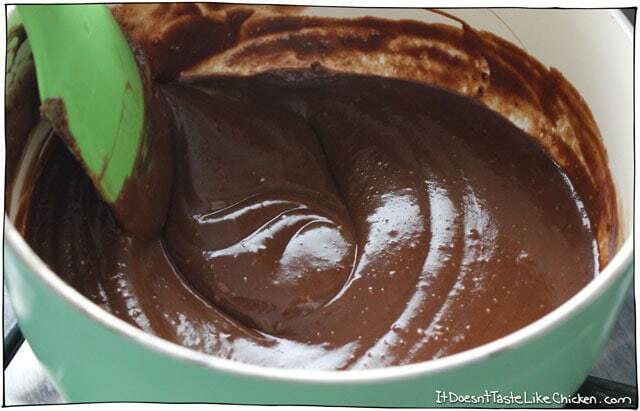 Add all of the Peanut Butter Hot Fudge Sauce ingredients to a small sauce pan and put over medium heat. Stir continually while the chocolate melts. Just before the chocolate has completely melted, remove from the heat and continue to stir until the chocolate has finished melting. This ensures that you do not burn the chocolate. It will only take 1 - 2 minutes. 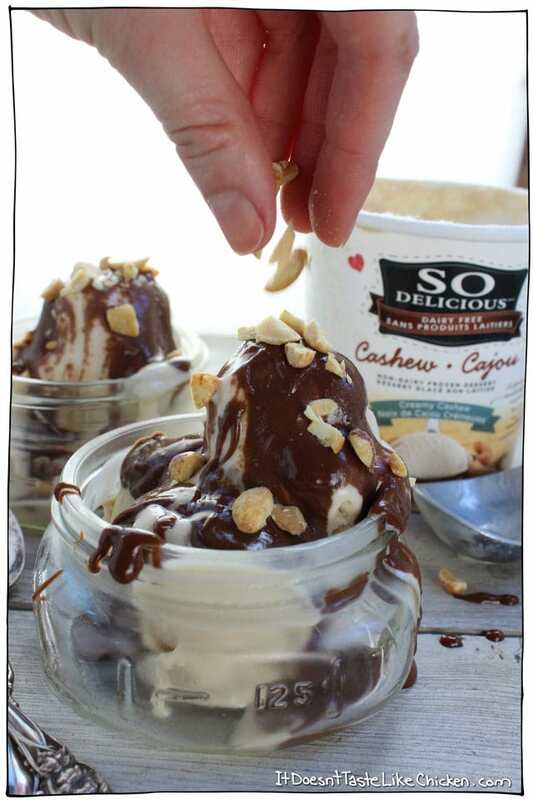 Assemble your sundae by scooping the cashewmilk frozen treat, drizzling the warm fudge sauce overtop and finish by sprinkling chopped peanuts. Bon Appetegan! 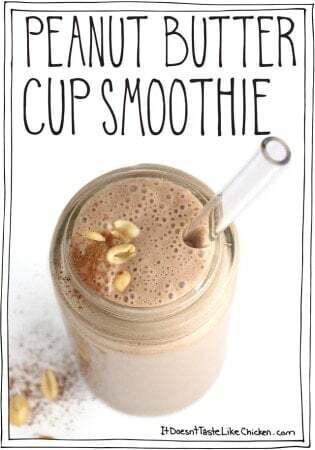 * You can use other non-dairy milks if you like, but I love full-fat coconut milk as it is so rich and creamy. 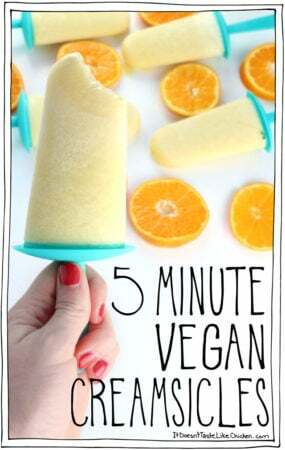 For So Delicious Cashewmilk Frozen Dessert nutrition click here. I have trouble finding any kind of vegan chocolate. Could I sub cocoa in the sauce, somehow do you think? The Ghirardelli chocolate chips in the gold package is vegan and their mini chocolate chips in the silver package. You can find them almost everywhere including Walmart and Target. I know dark chocolate of 70% and higher say they are vegan but the ingredient list says “may contain milk”. I worry a bit about that and have avoided using chocolate because of severe dairy allergies for a vegan family member. It’s difficult here in Ontario, Canada to find a lot of vegan products such as yogurt, cheese, etc. We do have Lindt Dark Chocolate 70% but I have not yet tried it because of the “may contain milk” warning on the ingredient list. Ah yes, if you have an allergy I would recommend the Enjoy Life brand. I live in Ontario too (Toronto), and you can find them at any health food store such as The Healthy Planet or at any Bulk Barn. Hope that helps! I will check at Bulk Barn, thanks, cheers! Yum! 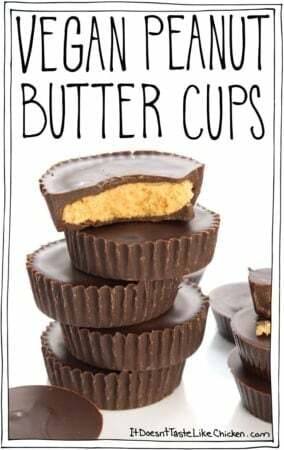 I love chocolate and peanut butter together. A match made in heaven! One of my favourite combos too!! So insanely scrumptious. OMG Sam, I think you’ve outdone yourself. 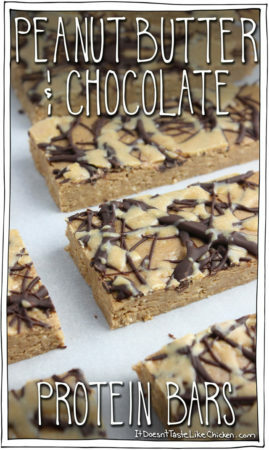 This may be my favorite recipe ever! Clearly I need to make sure I always have coconut milk for ice cream sundae emergencies! Haha!! I never knew sundae emergencies were a thing until I made this recipe… I feel like sundae emergencies will be a fairly common thing now!! Haha.